If you have any questions or want to enquire about dates, use our form to contact Sandra Clement or see their website for more information. A convivial home with homemade cake at the ready and a fire to settle by – Sandra loves having visitors. She gives you an independent apartment with a private patio, as well as two beamed rooms in the house – one has its own sitting room with a sofa bed for an extra guest. Beds are snugly topped with goose down, bathrooms have soft towels and slippers. Wake for a generous breakfast with homemade organic bread and good coffee in the dining room; guests in the Milking Parlour apartment have a continental basket brought over. Glyndebourne is a few minutes’ drive, there are masses of great gardens and festivals to dip into and the coast is within easy reach. Minimum stay: 2 nights at weekends. Milking Parlour minimum stay: 2 nights. We had a friendly welcome from Sandra with tea and cake. Home cooked locally sourced breakfast was superb. Nothing was too much trouble. It's a great spot to explore the Sussex Downs and to visit Charleston and Glyndebourne. The accommodation in the barn was first class. A big thank you to Sandra and Miles for their great hospitality. Outstanding B&B ideal for Glyndebourne (only 8 minutes drive away). Wonderful hosts - nothing too much trouble, very friendly atmosphere, spotless room, outstanding breakfast cooked to order etc. 10 star without question. GO and enjoy! My boyfriend and I spent a perfect anniversary weekend in the Milking Parlour at Little Norlington Barn. The place itself was wonderfully bright, clean, nicely decorated with a well equipped kitchen and the most powerful shower ever! Sandra was beyond welcoming and friendly and was unbelievably accommodating to our dietary requests. The private decking catches the morning sun and the whole place has an incredible view of the South Downs. We had the most relaxing weekend and would recommend this gem to anyone. Hopefully we can stay again! Thank you Sandra! A perfect B&B experience in the Sussex countryside. First class accommodation in a converted barn, excellent breakfasts with plenty of choice. A wonderful hostess, Sandra, who made the stay so pleasant, who made you feel at home and who was great conversationalist. I would stay again. 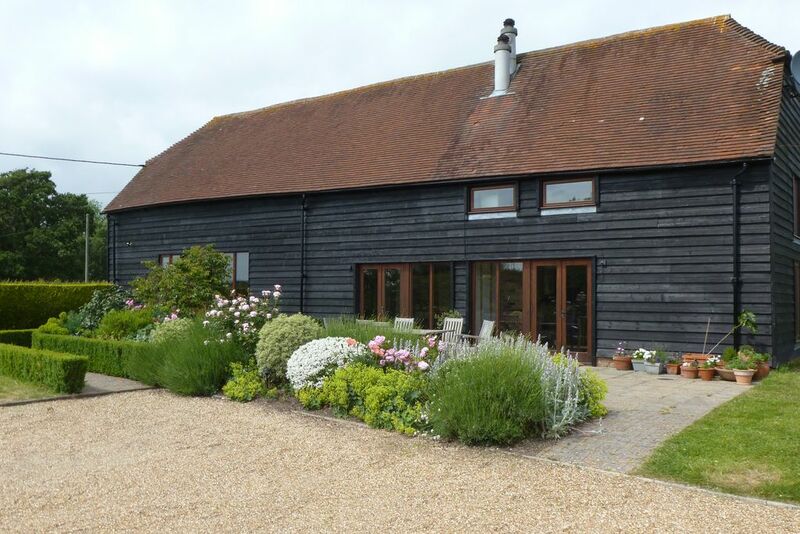 This beautifully converted barn is a gem, and the jewel in the crown is Sandra - our warm and bubbly host. An amazing breakfast, locally sourced, with home made goodies like yoghurt, breads and granola, will send you on your way each day. On your return , as you sink into the sofas in the spacious lounge, Sandra is there with tea, cake and lively conversation. Come back after supper to a log fire then climb the twisty stairs and fall into bed. Perfect. We stayed for two nights in the separate apartment which was beautifully furnished & appointed. Originally a milking parlour, it offers total privacy with the option of self catering (Kitchen included). But there are lots of v.g. local pubs. Your stay includes wholesome Continental/Scandinavian style breakfast with lots of home made organic touches delivered in person by Sandra in a plentiful basket. English Breakfast available in Main Barn on request. Isolation makes it great for star gazing & stunning sunsets. Easy access to Lewes, Eastbourne, Hastings and all they offer. Host gets a 10! Little Norlington Barn is set in an acre on a tranquil lane with South Downs views. Guests all have privacy as each barn room is up its own private staircase. The separate Milking Parlour has its own patio - and it's dog friendly. South Downs National Park and the South Downs Way are but a few miles away, perfect for rambling and cycling, or explore the beautiful landscape of Seven Sisters, Cuckmere Haven and Beachy Head. For the adventurous, learn to paraglide or go gliding nearby. Immerse yourself in the homes, haunts and art of the Bloomsbury Group – Charleston Farmhouse and Virginia Woolf’s home, Monk’s House, are close by, as is Berwick Church with its murals painted by Duncan Grant, Vanessa Bell and Quentin Bell. National Trust and other gardens are within easy reach, such as Nymans, Sheffield Park, Wakehurst Place, Great Dixter and Bateman’s, the home of Rudyard Kipling. For wine lovers, award-winning Sussex vineyards are all short drives away including Ridgeview, Bluebell Vineyard, Nyetimber, Breaky Bottom and Bolney. The new Rathfinny vineyard at Alfriston launches its first sparkling vintage this year.